Mountain Waters provides adventures and river trips for all levels of experience and thrill. Class II, III, IV, and V trips are available from just 2 hours to three days on 8 sections of river! Have a group that wants to take the plunge together? Check out our special group rates. The half day raft trip through Durango, Colorado is our most popular Class II-III adventure. Perfect for all members of the family and our trips run daily from May 1st into September. Meet us in downtown Durango at 643 Camino del Rio in the Albertson’s grocery parking lot for the highlight of your summer vacation. Ask about our Inflatable Kayak option to up your adventure level. We also have a 2 hour economy trip and a 6 hour full day trip. The trip of a lifetime! “Not to difficult, but difficult in places; long, but short enough to run in a day; wilderness, yet paralleled by the Durango Silverton Narrow Gauge Rail Road; the Upper Animas flows through the heart of the majestic San Juan Mountains. Overnights are common on this run just to prolong one’s immersion in the beautiful country. Enjoy the river: play it, work it, do a side hike up into the mountains surrounding it.” Choose from the Silverton Class IV – V stretch, the Needleton Class III – IV stretch, the Class IV Rockwood Gorge or do it all on our two and three day trips. The Piedra has two distinct sections known as the Upper Piedra Box Class II – III+ and the Lower Piedra Box Class IV. 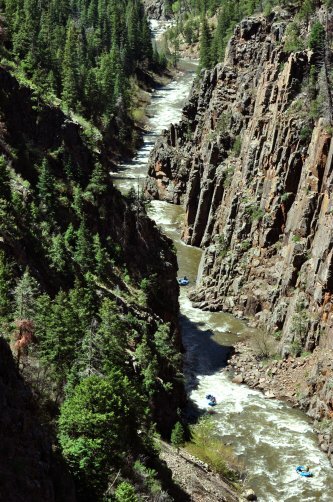 It is not as difficult as the Upper Animas, but this is still a trip for experienced boaters because of the steep drops, cold water and isolation of the box canyons. May – August, take a ride to or from Silverton on the world famous Durango Silverton Narrow Gauge Railroad. Your train ride is complimented with a guided and interpreted shuttle over two mountain passes on the San Juan Million Dollar Highway. Before or after your train ride we pair you up with our economy raft trip on the Animas River. It’s a full day of adventure that ends by 6 pm, leaving you plenty of time to enjoy a great evening in town! Combine an exciting, scenic raft trip on the Animas River through Durango, with an exhilarating zipline tour! Come soar through the air and float on the water for a vacation adventure you’ll never forget. Combine two activities that have drawn hundreds of thousands to the area for Durango’s outstanding recreational opportunities. Whether a novice or pro, this package will be tailored to you and your group making the most of your day. Experience for yourself the thrill of going from boats to ropes! The world famous alp like mountains of Silverton, Colorado boast some of the most spectacular scenery in the country. The San Juan Mountains will slacken your jaw and fill your camera as you take a scenic and historical 4×4 tour through time. Paired with Durango’s favorite activity, floating the Animas River through town, you will have a day of memories that will last long after you get home! What a great day of fresh mountain air and gorgeous scenery! Raft the Animas River and explore Durango on a comfy cruiser bike! Check out the Durango Discovery Museum, the DOW Trout Hatchery, miniature golf, restaurants and parks or even stop for a dip in the Animas! Our Upper Animas wilderness camp (the Needleton Bar & Grill) is poised between the Durango Silverton Train stop at Needleton and the gateway to Colorado’s largest Wilderness, the Weminuche through Chicago Basin. Use Mountain Waters camp to base your hiking, fishing, back country skiing, mountaineering, elk hunting or rafting/kayaking expedition. See why this camp is the envy of all the area’s outfitters! The owners and staff of Mountain Waters Rafting (MWR) believe that river rafting is one of the funnest things in the world to do. The joy of floating down a river or being challenged by difficult whitewater has created an insatiable passion in us. “It’s just super fun and becomes this huge thing in your life. Being connected to the outdoors and sharing that with people is a job that you know makes a difference”. Owners and luckiest guys in the world, Dan Bechtel and James Wilkes.